Here are some shots of the crick and the cabin site, where Jimbo crochet hooks come from and where all the funds raised from hook sales are spent. Come visit and check up on your investment! This is the area that'll be the backyard from the cabin. It'll look like that when you visit... no plans to put in grass or fru fru stuff like that. That pile of wood? Hook fodder. Actually, alot of it gets burned. 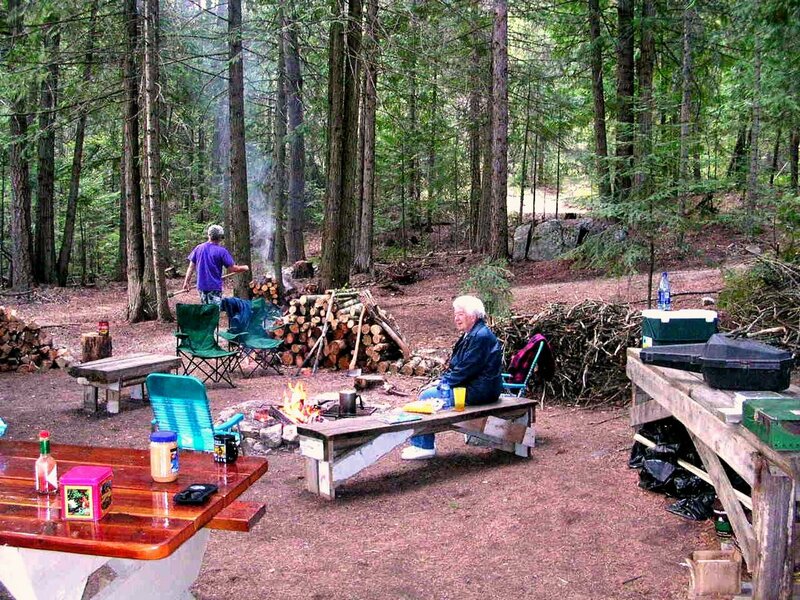 That beauty of a picnic table in the lower left was built by my nephew Bobby, a better woodworker than me. 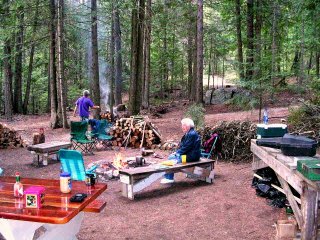 The rest of the stuff you see, including the bench Bert's sitting on, i built from timbers and such from one of the fallen down cabins on the place. Bert's my oldest sister, and she grew up on the crick.. even taught school in the little one room school house down the road. 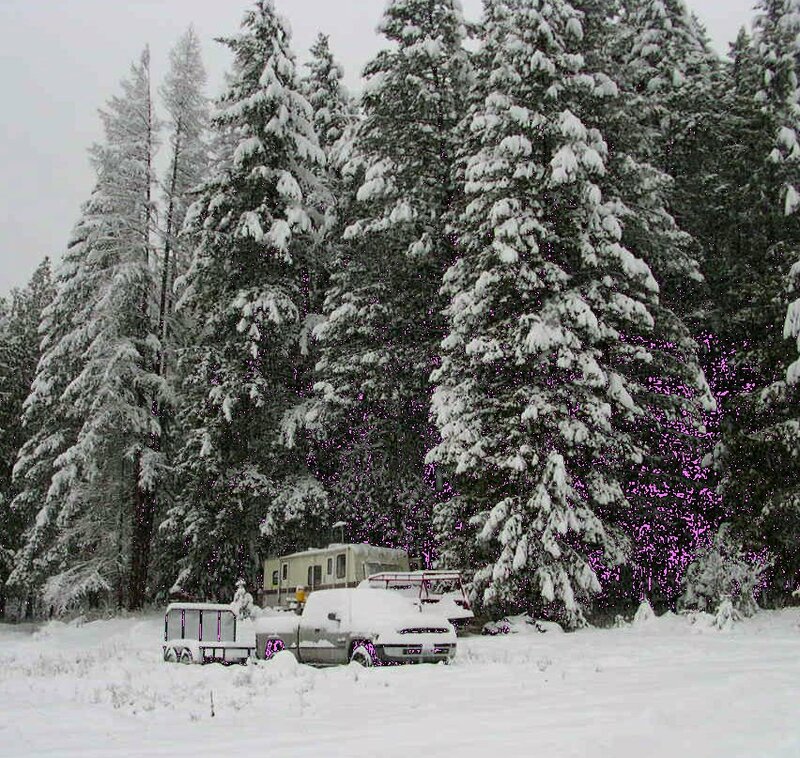 This is the trailer (look hard, its there) we have up on the ranch till the cabin's built.. lotsa snow eh? This picture was taken last winter, but would look about the same today. The cabin site is just to the left and behind the trailer. 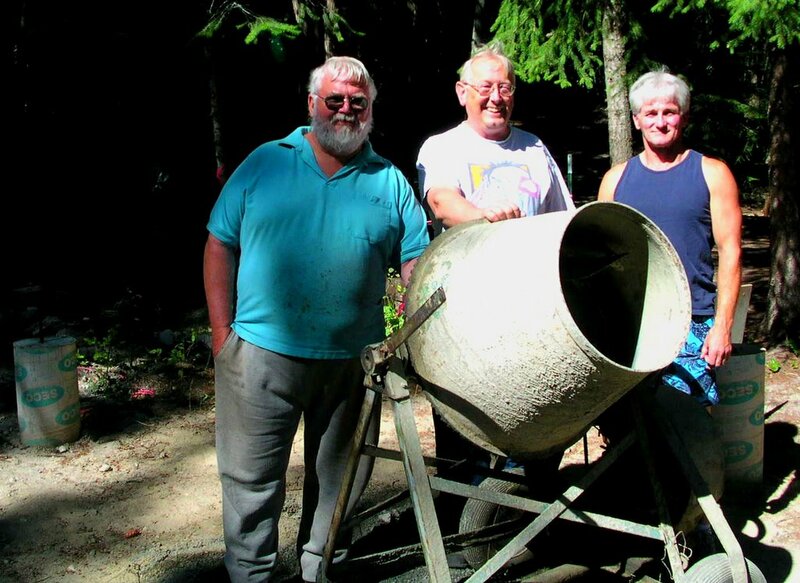 Here's a shot of some fellas on the construction crew, three doods and a cement mixer (actually we get lots of friends and relatives up there to help out, but these guys are a there a lot). These are a couple of the best buddies a guy could ask for, Jim (Left) and Russ (rt) are incredible about coming up to help. Russ was best man at our wedding and is the husband of Beatr (her username in C'ville). Jim's a fantastic woodworker, and excellent gourmet cook. And that handsomely rugged dood in the middle? My father. no? Actually i'm much better looking in person. And the real worker of the bunch, the best cement mixer in the world, inhereted from and named after a cherished family member, Vern, who used that same mixer way back in the 40's and who taught me alot about the outdoors and woodworking stuff. Vern's an 8hp Wisconson gas powered beauty and works like a dream. Love that mixer!! Ok.. i'll quit here but there's lots more cabin stuff to show, and i will. Soon. Plus more hooks i have in the making. Thanks for following along. I love huckleberries. 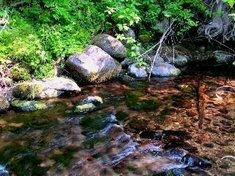 I lived in Missoula for about 6 years and knew of some great places in that area to get them. Scary bridge, lol. Thanks for sharing your homestead. 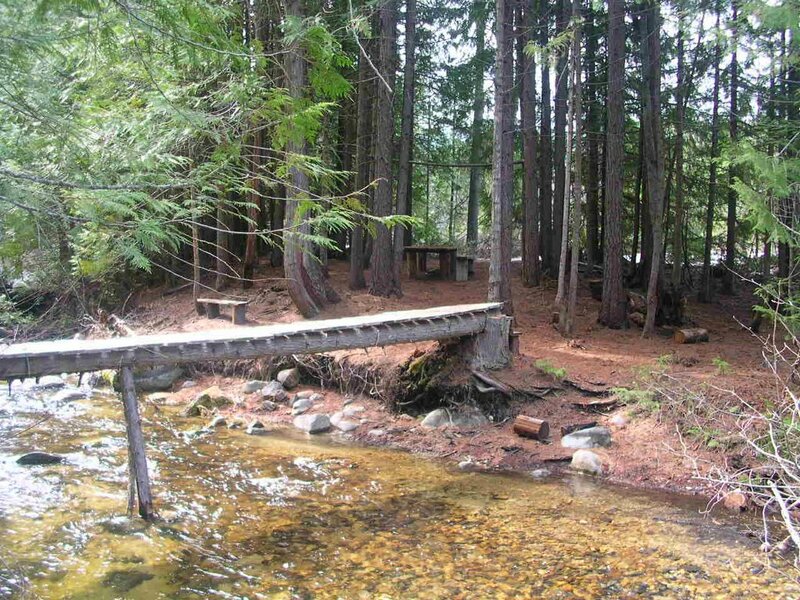 Will you be using trees from your property to build your cabin? So nice to see your photos, it looks absolutely beautiful there! Thanks guys.. its pretty special to me alright. I'm sure its nothing outstanding from a outside viewpoint but it sure has special memories for me. You're a lucky man to have had the chance to capture your old homestead. So glad to see a pic of you too, was gonna ask for one of those and I'm glad you beat me to it. I like to put a face with a name, and I really wanted to be able to see who made my hooks that are coming (waiting impatiently!). Mighty handsome dood indeed! Ah, its so nice to hear from kindred spirits. You know its not everybody who can understand just what such a place can mean to someone. Its been such a pervasive dream of mine for so long that i still, several years later, find it hard to believe i have the place back. Heartfelt thanks for your kind comments.